Alex Baseball gunning up for the Gauteng Baseball Federations League Season , opening October!! 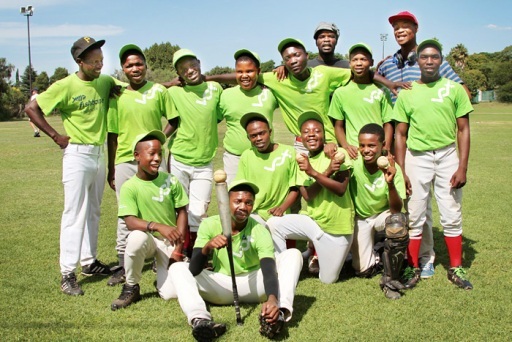 We are proud to announce the selection of several Alexandra baseball players to compete in the Junior ICT, based on their performance in the IRT held at Marks Park in April 2012. Congratulations again to a job well done and good teamwork in support of Gauteng Baseball! I've told you about what we've accomplished so far with Alexandra Baseball, which mainly meant getting more equipment. I've also written about the upcoming Funfest in Alexandra where we'll use the bulk of this equipment for the first time to give a lot more kids exposure to the sport. If the day is a success, then many more kids will sign on for league play in the upcoming season, and several schools will start fielding their own teams. And guess what that means? We'll need more equipment! Collect used baseball equipment by contacting your local high school or baseball club; you could hand out fliers and get the entire school involved, or better yet, let your kids do a "Baseball for Africa" drive, which I think would make a wonderful outreach project. Just think of how many people you know who have their garage full of unused sports gear. All of which would be put to very good use here in Africa. When you're finished with your collection drive, all you need is a place to keep it for us until I can have it shipped to where the next expat container is leaving. I've included a sample donor letter below, which you're welcome to use as is or modify according to your needs. I can also provide more pictures. Play it Again Sports often has very inexpensive used clothing and equipment on offer, and you might be able to negotiate a special deal with them, in case you'd like to help but don't want to get involved in a donation drive. If you don't have access to baseball gear but would like to be involved, consider making a donation to Alexandra Baseball. Any funds we raise in this way will be used for shipping expenses, team transport, and field improvements. I think this is a good time to give you an update on what's been happening with my Alexandra Baseball project in the past few months. In fact, this is the first article in a series I'll be running the next several days to tell you about what we've accomplished so far, what our plans are, and where we still need help. As some of you know, I stumbled upon this township baseball league shortly after moving here and have been trying to help them with their effort to grow and develop more players. Since the biggest obstacle seemed to be the lack of equipment (baseball gear is already hard to find in South Africa, but it is especially difficult when you have absolutely no money), we set as our first goal to get more of it. Like everything I've done here in Africa, it has taken longer than I envisioned, but when I now take a look at what we've collected so far, it is fairly impressive. I realize I'm a bit tardy with this post. I was going to write it "just now" about a month ago. You know I've been helping a township baseball team raise funds for new equipment, and I'm always on the lookout for opportunities to promote their cause. 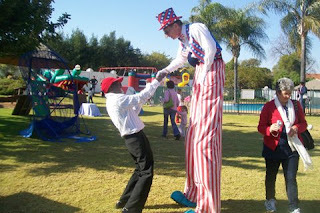 Just such an opportunity arrived when I was approached by the American Society of South Africa about putting up a booth and running some baseball games for the 4th of July bash at the American embassy in Pretoria. Even though we don't have our equipment yet for Alexandra Baseball (shipping stuff to South Africa takes time, and, in a country that has produced Eskom, it also takes bureaucratic tenacity! ), I wanted to take this opportunity to give you a status report. A huge thank you to those of you who've helped out. We are now at over $1,800 or ZAR13,600, enough to get the equipment shipped and some more! I was stunned at the outpouring of support, first from a large number of Singaporeans - who, you should know, don't even play baseball in their country - and then from many of my friends back in the U.S. (who I had prodded to uphold our country's honor by catching up with Singapore). Slowly but surely we are getting there, with the help of so many of you. Thanks to all of you who have already donated to support the baseball league in Alexandra! We now have close to ZAR 5,000 (about $700) and I only need ZAR 2,000 more to pay for the shipment of the bats, helmets, gloves, and catching gear donated to us by Pitch in for Baseball. If I can find just 20 more donors for $10-$20 each, it will be enough! Last Sunday I went to a game played by the U16 team. As you can see above, they are a happy bunch. Even though they looked a bit ragtag with their mismatching socks and belts, they were the better team that day and won handily against the Marks Parks Mustangs, 12-7. I saw some excellent pitching, batting, catching, and base running (the latter a bit too aggressive for my heart rate but it worked very well most of the time).